Innotech has pioneered the technology for making folds in the web in the running directions at speeds up to 2,500 FPM. Light paper as well as heavy stock can be folded without gusseting, cracking or marking. The next generation design of Innoformer has proven highly successful in folding at high speeds in Gravure and Offset presses as well as in many non-heatset presses. Innoformer assembly consists of air bars mounted at compound angles between two fixed rollers and provided with specially machined conical ends. 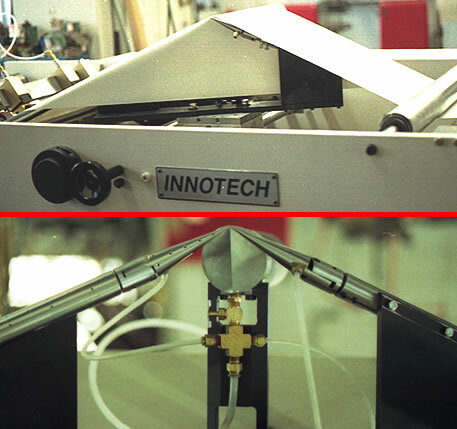 All elements of Innoformer are fixed and web is folded as it travels from inlet roller to the exit roller by the special geometry of this arrangement. High speeds without marking or gusseting are achieved by the gentle folding action with air lubrication between paper and the folding bars. Higher speeds for folding a full range of paper from lightweight to heavy cover stock. Savings in make-ready time by substantially eliminating the need for adjustments. Remote adjustment of former assembly. Eliminates tearing, marking and gusseting. Simple to use, does not require high skill levels to set up and operate. Innoformer technology is used in Innotech Prefolders and Cover production Systems.